This short article was produced by Captain Jon Link at 32 Canadian Brigade Group Headquarters, based on research that I conducted after finding Pte Desmond’s grave in a local cemetery. 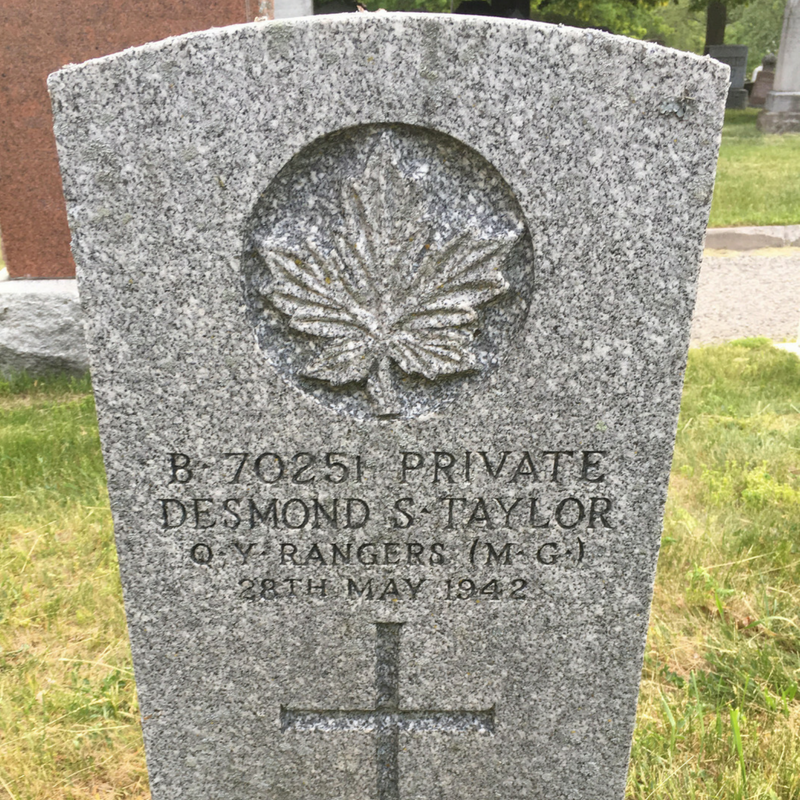 Toronto – Nearly 75 years after his suicide, Private Desmond Taylor of the The Queen’s York Rangers RCAC 1st Americans was remembered by members of Regiment in a ceremony at his graveside near St. John the Baptist Norway in the Beaches neighbourhood. Although there are many unknown details, Private Taylor probably killed himself after being outted as a homosexual. The Board of Inquiry into his death indicates that while training, he read a psychology book which suggested that he write about incidents from his life that caused him anxiety. He did so, committing to paper his innermost thoughts and concerns – but he then lost his writings. Who found the papers and what they revealed about Private Taylor remains a mystery, but he soon found himself being harassed and perhaps blackmailed for being gay. Perhaps unsurprisingly, Private Taylor soon struggled with his training, was discharged from the Air Force and returned home to Toronto. He must have been determined to do his part in the war against Fascism because, despite his earlier experience, he re-enlisted in early 1942 – this time in the army as a Queen’s York Ranger. But his reputation followed him up to Camp Borden, Ontario and, in only a few months, the harassment began anew. Again, his performance began to suffer. On May 27th, Private Taylor was late for parade and given seven days of confinement to barracks as a punishment. Another soldier confined with him that evening was Private Frank Spirnyak, who testified at the Board of Inquiry, “[Private Taylor] has been my best friend since I came to Camp Borden and he considered me his best friend. He was quiet and friendly and like a brother to me.” Frank knew his friend was under great stress because of the lost papers, but evidently did not know how difficult the situation had become for him. The next morning, Private Taylor’s body was found on the bayonet assault course: he had shot himself through the chest with his service rifle. Private Taylor’s death did not receive much attention in 1942, and his name was lost to the Regiment until very recently. Given the number of Canadians who were killed during the Second World War, it is easy for one death to be forgotten. But Private Desmond Taylor is now remembered and, in addition to serving as a reminder, his story illustrates how far the modern Canadian Armed Forces has come. It’s not perfect, but Private Taylor would likely be comforted to know that sexual orientation is not a barrier to service and that harassment of any kind is a crime.